Developed by Telltale Games. Published by Telltale Games. Released May 27, 2014. Available on PC (reviewed), PS3, Xbox 360. Note: There will be minor spoilers here for the previous episodes of Telltale's series based on the Fables comics by Bill Willingham. Like a convoluted or epic TV plotline, the events of individual episodes of The Wolf Among Us can be quite memorable, but it can also feel like filler or setup for the eventual dramatic payoff later. The fourth episode of Telltale's story touches on a lot of different threads in the spiderweb of the case Sheriff Bigby Wolf and Acting Deputy Mayor Snow White have been investigating. You're whisked from location to location, checking in with characters and introducing some new ones, but it's without the meaty investigation the series has shown in the previous episodes. "In Sheep's Clothing" isn't a bad episode for all its brevity, but it leaves you wanting a climax that never, ahem, comes. The lack of a climax was in direct contrast to the last episode. Bigby was hurt pretty badly in his altercation with Bloody Mary, and we finally realized the source of all the violence in Fabletown can be tied to someone called the Crooked Man. But how exactly he's related to the murders of Lily and Faith is still the core mystery of the series and that's the main thread that connects all of Bigby's actions in this episode. We just don't learn very much. That doesn't mean there aren't some amazingly dramatic moments. While the doctor removes silver shards from Bigby's body, Bigby himself sets his broken arm. Here's where the QTEs of the series shine. It's not clear exactly why there's so much tension involved with these sequences in Telltale games versus others, but I find myself near panic during each one even though I'm reasonably positive I will not fail. There is some excellent character development too. Bigby's relationship with Snow is complicated even more by her insistence on the laws and rules of Fabletown. Colin, the talking pig from one of the Big Bad Wolf's stories, is still in his friend's apartment and Snow says he has to go to farm or get a glamor to make him look like a human. 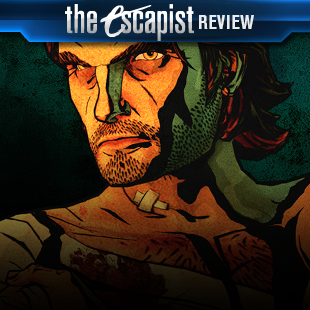 Bigby has to choose between loyalty or the law. There's also the chance for a touching moment with Woody, aka the Woodsman, as well as Beauty and the Beast. Toad, Nerisa and Bluebeard all make memorable appearances, but here's where it start to full like a muddied episode. In addition, new characters are introduced that are satisfying blends of fairy book stories, folklore and New York stereotypes. The Jersey Devil runs The Lucky Pawn shop and in his human form he's a sniveling, liver-scarred and balding punk who'd look at home in a Sopranos episode. It's fun to cross verbal swords with him, but even more enjoyable to dust him up. We also get to meet Tiny Tim, who is grateful Bigby leaves out the "Tiny" when addressing the grown up kid from A Christmas Carol. In Telltale's marketing, "In Sheep's Clothing" has been touted as the penultimate episode to the series. It is exactly that. As a standalone 1.5 hour experience, it does little more than bring all the story threads together but you'll have to wait until the finale to see the full tapestry. The final scene in this episode tantalizes you with just a glimpse of what's to come. It doesn't end on a cliffhanger per se, but it does lead directly into the finale. Bottom Line: The story is moved forward, and the quick time events and character development make you wish you could play the concluding episode right now. So, in essence, this episode does its job quite well, I just wish it had more internal resolution. Recommendation: Buy it. Play it. Join me in waiting anxiously for episode five, lit cigarette in hand.